9th July - The young froglets (about 1cm in length) have now left the water. They will spend much of their adult lives on land in damp grassy areas and undergrowth, eating small insects and slugs etc. During the winter they will hibernate in mud at the bottom of ditches or ponds. When they are mature full-size adults, they will return to a pond or lake during early spring for mating and egg-laying. 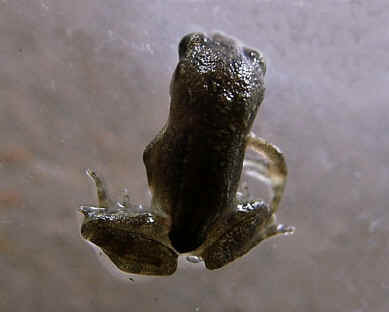 The whole metamorphosis cycle of "egg to tadpole to frog" will then begin again.